Assam teas reflect the dense life of the land where they are grown. If an Indian crow left Darjeeling and flew southeast for about 125 miles, it would find itself in a land rich in biodiversity and tea. Assam, the namesake of the tea varietal Camellia sinensis var. assamica, contains rainforest, grassland, and bamboo forest. It is also the world’s largest tea growing region with hundreds of larger tea farms and tens of thousands of smaller, independent growers. 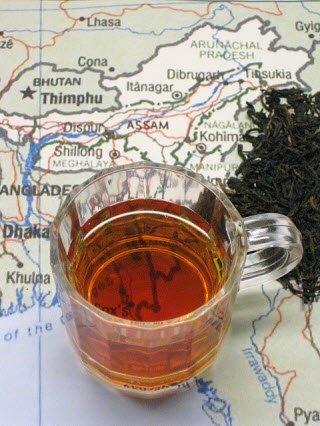 Although the Darjeeling and Assam tea industries can trace roots back to the middle of the nineteenth century, the two areas and their teas differ. Darjeeling is known for its higher elevations, while much of the tea in Assam is considered low-grown. Early Darjeeling plantations grew the Chinese Camellia sinensis sinensis varietal of tea plant. Assam had less success with it and cultivated the assamica varietal. Darjeeling made a name for itself through the unique character created within its confined bounds. 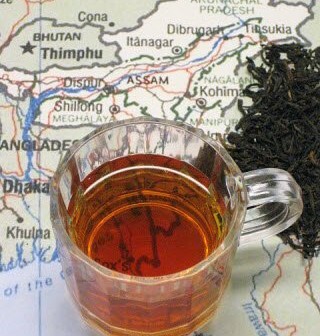 Assam teas, being more abundant, are often the main ingredient in chai. Many Assam teas are processed in the CTC method, meaning they look like tiny pellets or granules. In years past, Assams were the preferred ingredient for adding briskness to breakfast teas. Their robust character makes them a suitable companion to milk. The combination of the assamica varietal of Camellia sinensis and the rich, lower elevation fields in which they grow give Assam teas their bold structure. The finer orthodox Assams often come from the second flush harvested in May or June. The dry leaf usually consists of broken leaf. Many Assams have golden yellow tips with a larger proportion of darker, grey-black colored leaf pieces. The aroma is rich with the classic black tea smells of tannin, but can include molasses and stone-fruit sweetness (like mango). When steeped, the liquor of Assam tea radiates colors in the range of copper to red-brown. Its malty characteristics are best known, but many also note sweet, syrupy aspects like molasses or honey. Good Assams are brisk without being harshly astringent or bitter. Some even carry a light fruity component resembling that peachy-mango note found in the dry leaf. The aftertaste is the final reward. Here the syrupy stickiness should balance with the brisk astringency to give the impression of having just swallowed a spoonful of honey combined with some of the tartness of grape skin. Generally, the longer and richer the aftertaste is, the better.